Our view of the Conestoga River. Okay, just one more post today! That will be a wrap on Lancaster for now, until my next adventures out there. So far, Travel Guide has been a mix of old posts (as noted at the bottom when applicable) which are coming over from my other blog and brand new. By the end of the month, all posts will be entirely new. Next up: the Kennett Square and New Hope areas of Pennsylvania, and then some from Connecticut. Also coming in the next few days are some new reviews of restaurants from New Jersey. There’s a lot going on! Here’s another place in Lancaster where I have been coming for years. I’ve always had a lukewarm approach towards it because dining experiences here have ranged from pleasant to dreadful. This one was a hearty mix of both, leading to a score which was a little above average. We started sitting outside on the patio. 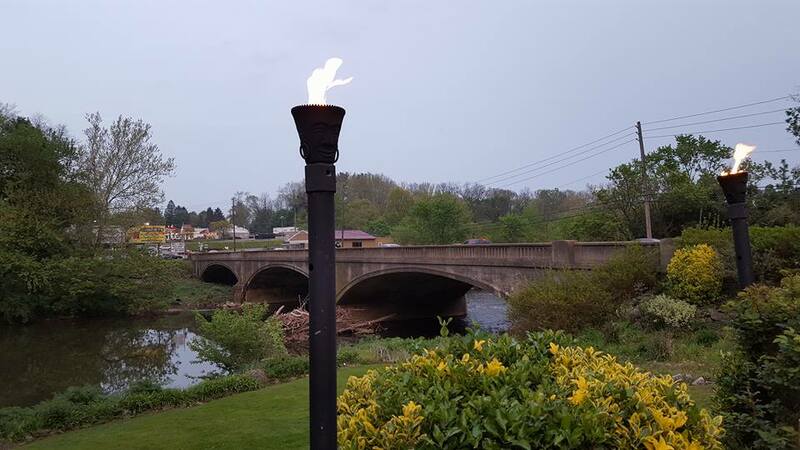 It was a beautiful spring night along the Conesotoga River. I had a Jack Daniels on the rocks which was a nice pour and only $5.50, which is about as cheap as you will ever see it. My friend had a frozen margarita which was long on ice and short on booze. Coming in at $8, it was a total waste. Our appetizer was the brisket fries. This was the highlight of the night. 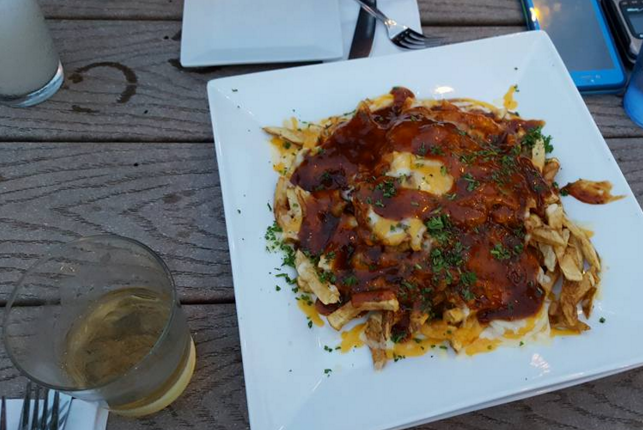 A large mound of fries was covered in brisket, barbecue sauce, baked beans, and cheddar cheese. The flavor was awesome, though they could have put a little more brisket on it. The $11 price was perfectly fine. Halfway through the dish, it started to rain and we moved inside from the beautifully lit patio. We ran into some more trouble with the meals. My pulled pork sandwich was actually very good. A decent amount of pork covered in the same barbecue sauce as the fries. It was tangy with a hint of citrus. It tasted homemade and was light and refreshing. The sandwich also had coleslaw and pieces of bacon on it. Good flavors there. My only complaint was the side of fries (which were an added charge). They were soggy and almost cold. He had the lumpy bleu cheese burger, which also had bacon. He ordered it medium and it came rare, just short of bleeding. The burger itself was also unseasoned and he said all he could taste on the entire thing was the bleu cheese. However, he noted if it had been cooked properly and actually seasoned, it probably would have been fine. 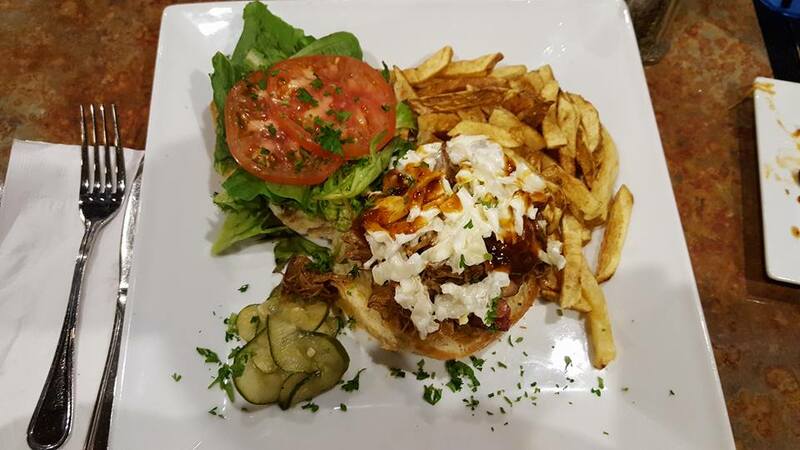 Pulled pork sandwich topped with coleslaw. Tonight was typical of a dinner at Conestoga. It was a split: something good, something bad, something okay. Even my parents are split in their many past visits. My mom enjoys it but my dad is not a fan. Overall, the prices were good, save for the margarita which was a glass of ice. My friend and I agreed that we would probably come back, but just for appetizers. It is also open later than most places in sleepy Lancaster County (2 a.m.). That might be appealing to some. My final verdict will be slightly higher than I thought it would be, but still average at 3.5 out of 5 stars. This review was originally posted here. Conestoga Restaurant is located at 1501 East King Street in Lancaster, Pennsylvania.